Find hotel near Muzeul Municipiului Bucur .. 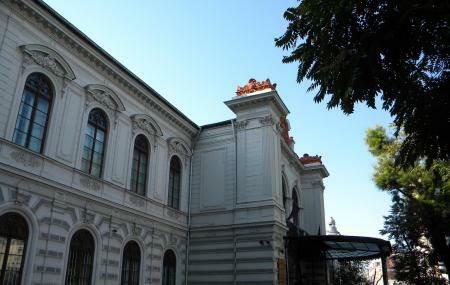 The Bucharest City Museum has multiple branches, but this building, the Sutu Palace in the University Square, is their headquarters. Completed in 1835 in Gothic style, the building today houses a rather miscellaneous collection of art and artefacts - photographs, old maps, printings, archeological findings, vases, a picture gallery, arms, seals, coats of arms, weapons, uniforms, flags, costumes - none of which are follow any particular theme. Perhaps that is why the museum's importance is so frequently overlooked by visitors. It is well worth a visit. The architecture and interior decor alone are worth a few photographs. How popular is Muzeul Municipiului Bucuresti? People normally club together Romanian Boutique and Kretzulescu Church while planning their visit to Muzeul Municipiului Bucuresti. This place is the ground zero for the new Romania after liberalism. Almost all historical places including famous theaters are around. Possible to reach here by subway as far as I understand from my short tour around here. Must see when in Bucharest. Bucharest (the Little Paris, as the French people named it at the beginning of the twentieth century) can tell you some amazing stories - so, you have to visit this museum! History, art, music! Wow!